Simon Chadwick, a Sports Enterprise professor at Salford Business School in Manchester, England, urged caution when relying too much on data coming out of China. 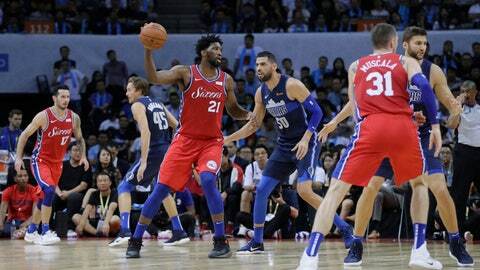 He said the NBA’s benchmark in China is obvious, but that the league still needs to work hard “in new and emergent sports markets” if Silver’s hope of basketball supplanting soccer is going to be realized. China’s affinity for the game isn’t truly understood until seen in person. Marvin Johnson moved from the Miami area to China in 2017 to teach and coach at a basketball academy there. The first thing he saw when he deplaned in Beijing was a massive Li-Ning store that was basically a shrine to Heat guard Dwyane Wade, who now has a lifetime contract to endorse the Chinese brand’s products. Curry’s summer might have epitomized the marriage between the NBA and foreign lands. He didn’t just go to China. He also hit the Philippines, England, France and Japan. He tossed out the ceremonial first pitch at a Japanese baseball game. He shot around with soccer star Neymar. He watched a Premier League game in England. In China, where Yao Ming really got things started as far as the NBA growth, it’s not uncommon to see fans watching streams of live NBA games on their phones during the morning commutes to work, since that’s when those games are happening in the U.S. and Canada.